Appy Pie, a cloud-based apps builder, announces passage of the 100 percent mark in their Kickstarter funding project for their Game Builder Project. On August 26, 2013, the Game Builder project on Kickstarter successfully passed the 100 percent funding level. Every day hundreds of apps are created using their Platform and daily a winner is shortlisted based on the following criteria including level of commercial success, App Speed, overall utility, and quality of user experience and presentation. Appy Pie, a cloud-based apps builder, announces passage of the 100 percent mark in their Kickstarter funding project for their Game Builder Project. On August 26, 2013, the Game Builder project on Kickstarter successfully passed the 100 percent funding level. While Appy Pie has passed 100 percent guaranteeing funding, the Kickstarter project is far from over. The fundraising will continue on Kickstarter for the remaining two days in the 30-day campaign. Backers now know that they will get their Mobile Game for sure because of the project reaching the funding level. Appy Pie’s goal was to raise $10,000 to help fund its Mobile Game Builder solution, which makes building a mobile game ‘as easy as pie’. The Kickstarter campaign will finish on August 28th 2013 and was aimed at raising funds for Appy Pie’s unique mobile game building platform, which will become publicly available in November. Choose a genre from the game library, such as Action. For the public release of Game Builder in November, there will be at least four genres to choose from, with more added on an ongoing basis. Provide information such as the game name, logo and description. Create main characters and enemies, weapons, obstacles and collectibles using images from the default library or from uploaded custom images. The finished HTML5 mobile game is then available for immediate download on iPhone, iPad, Android or Windows 8 devices or users can simply play it in their web browser. Appy Pie plans to add a number of advanced features to Game Builder in the coming months, including game monetization, game analytics, push notifications, real-time changes and the ability to add paid levels with in-app purchases. Those who pledged their support for Game Builder on Kickstarter will get a variety of rewards depending on their level of contribution, from digital downloads of the mobile games they design to the opportunity of becoming Appy Pie's first white label mobile game reseller. To watch a video describing the project, go to the Kickstarter page at http://www.kickstarter.com/projects/1362913594/993378770/widget/video.html. 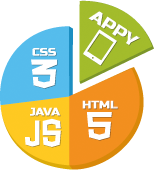 Appy Pie’s cloud-based mobile apps and game builder solutions allow everyone to make an app. The platform allows anyone with limited or no technical knowledge to create basic mobile apps for iOS, Android and Windows 8 based mobile phones. There’s nothing to download or install and no external programming required: just drag and drop. Appy Pie is trademark of Appy Pie, Inc.
Kickstarter is the world’s largest funding platform for creative projects. Kickstarter is full of projects, big and small, that are brought to life through the direct support of regular people. Since its launch in 2009, more than 4.4 million people have pledged over $683 million, funding more than 44,000 creative projects. People who support these projects through funding do not profit financially, but are instead offered non-monetary rewards to thank the supporter.